Thomas Sharp rose to the challenge of compiling a 20 break prior to making his debut on the regional circuit. 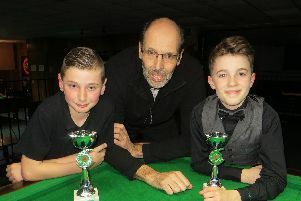 The 12-year-old, from Portsmouth, exactly met his target by knocking in a six-ball run against newcomer Harley Rogers in week 17 of the Waterlooville Sports Bar Junior League. League organiser and World Snooker coach Tim Dunkley, who runs sessions for under-19s from 4.30pm to 6.30pm every Wednesday, said: ‘I’m delighted for Thomas. ‘I set him a target and he responded in the best way possible. Meanwhile, champion-elect Samuel Laxton won his 50th frame of the season – against his younger brother George – after earlier recording the day’s highest break of 27. Following next week’s matches, the league splits into two divisions. A new league starts on September 20. Names are now being taken for a proposed Monday junior league to run at the same time using the same format. Elsewhere, former England under-18 champion Mark Lloyd pocketed £50 for reaching the quarter-finals of the MIUS Cup at the South West Snooker Academy, Gloucester. The 17-year-old, from Gosport, lost 4-1 to Birmingham’s Hamim Hussain. The high-quality event for under-18s attracted entries from as far away as Belgium and Hong Kong.